Aging in place home remodeling has become very popular as an ever-growing portion of the population fits the Senior 55+ description. Aging in place home remodeling for the bathroom space requires special consideration. For example, consider strategically placed grab bars — you might be surprised at how useful they are for friends and family members of all ages. Another consideration is a walk in tub or roll in shower. Which would you prefer? The walk-in tub provides a pleasant soaking experience, similar to a regular bathtub. Equipped with aging in place safety features such as an anti-slip bottom, grab bars and a bench seat, the walk-in tub offers the best safety options with the highest level of bathing experience for the mobility impaired individual. 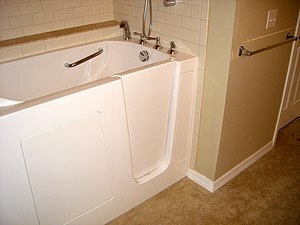 For those who cannot stand for long periods, the walk-in bathtub allows easy access to bathing. A final advantage of a walk-in tub over a roll-in shower is the relaxing bathing experience found in the tub. Many walk-in tubs are available with multiple spray jets, digital temperature and thermostatic controls, and hydrotherapy — perfect as part of a home remodeling for the bathroom. Plan for the future, by providing such things as wall reinforcement for future grab bars, electrical conduit and a shaft for an elevator if anticipated, etc. Storage in the “optimal reach zone” — the space between 20 inches and 44 inches above the floor to a depth of 20 inches away from your body. Use drawers instead of cupboards for easy slide-out access to all of the stored objects. For more information about walk-in tubs and roll-in showers as part of an aging in place home remodeling for the bathroom, contact the experts at Stair Lifts Atlanta / Atlanta Home Modifications, LLC. We will visit you in metro Atlanta or north Georgia, evaluate your home, and provide design and pricing information. The areas we serve include Athens, Atlanta, Gainesville, Buford, Canton, Woodstock, Kennesaw, Cartersville, Douglasville, Newnan, LaGrange, Peachtree City, Fayetteville, McDonough and Stockbridge. Contact us today at 770.880.3405. While falling down stairs is one of the leading causes of injury among 50+ seniors and the elderly, not all homes have stairs. The other room where most falls occur is something every house has: the bathroom. With sometimes slick floors, slippery showers and moisture all around, bathrooms can be a dangerous place for 50+ seniors & elderly in Atlanta homes. However, the bathroom can be made much safer and accessible with the right assistive technology and home modification accessibility upgrades. Most bathrooms are poorly designed for the elderly or those who are mobility impaired. Space is limited and most homes come with a shower/bathtub combo which requires stepping over the side of the tub. All of these factors make the bathroom potentially unsafe. Here are some ways to help lower the danger. Preventative measures to help 50+ seniors and elderly Atlanta residents stay safe include home modifications such as wheelchair ramps for homes, straight and curved stairlifts, and roll-in shower and walk-in bath installations. Would any of these give you the safety and security you require to be protected in your home? Get more info from the certified professionals at Atlanta Home Modifications at 770-880-3405 or click here to learn more about bathroom fall prevention for 50+ seniors and elderly Atlanta residents. Atlanta Home Modifications, LLC has the accessibility expertise, certified-aging-in-place specialization and home modifications experience to assist you with the selection and installation of a new Ella’s Walk-In Tub for your home. Ella’s Deluxe size 29.5” x 55” (59” with extension to fit tub opening) x40”. 12 Therapeutic Hydro Massage Jets with a 1 Horse Power Pump. 10 Therapeutic Air Massage Jets with a 0.5 Horse Power Air Pump. In-Line 1.5 KW Water Heater. Ella’s Dual Drain Technology — Dual 2” brass & copper drains, and two copper overflows for dependable drainage. 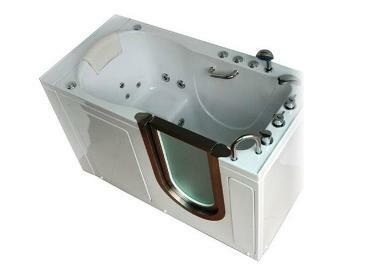 High Quality Cast Acrylic Tub with Low Threshold Step In. Air Flow Control for Softer Hydro Massage. Two Built In Safety Grab Bars. Removable Rubber Back Support in White. Brass Chrome Plated Designer Spout, Two 2 Way Diverters with ADA Compliant Handles, and Pull Out Hand Held Shower Mixer. Contact the Certified Aging-In-Place Specialist at Atlanta Home Modifications, LLC for a walk-in tub and low-threshold roll-in showers Safety Assessment by calling 770.880.3405, or by email at Info@AtlantaHomeMods.com. Visit the Atlanta Home Mods website, today. Atlanta Home Modifications, LLC provides accessible stair lifts, wheelchair platform lifts, wood and metal ramps, roll-in showers and roll-under sinks for residents of North Georgia.